Beaming proud at a family of three we were blessed with the fantastic news that another little addition would soon be joining the Sawchuk family. During the beginning of our second pregnancy we tried to remember the joy of the physical changes and emotions pregnancy plays on the human body. This joy soon turned into fear as we received some devastating news at 19 weeks. It was then revealed to us that our son Vaughn, had a very rare heart defect called Ebstein’s Anomaly. A condition which influences the anatomical construction and functionality of the heart. In the beginning, we understood that Vaughn’s condition was classified as mild to moderate, and we continued through anxiety filled ultrasounds and echocardiograms. The cardiologist who was overseeing Vaughn’s progression referred us to one of her colleagues, based out of the Stollery Children’s Hospital in Edmonton. In order to give Vaughn the best possible start to his life, it was here he would be born. A couple visits to Edmonton for preliminary meetings to go over a birth plan for Vaughn, coupled with more echocardiograms, and a visit to the Stollery to familiarize ourselves with our fate. It was becoming very apparent that many preparations would be necessary to facilitate our stay. These arrangements were our first glimpse of what the future would hold for Vaughn and our family. I will always remember holding Jaime’s hand while holding back tears trying to understand the scope of severity which was now our families life. It became very surreal for the both of us, almost like we were looking down upon ourselves watching an epic life story play out, no story though…reality. 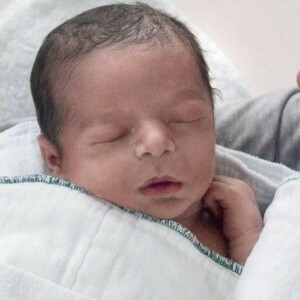 Around 28 weeks Vaughn’s condition took a dramatic turn and as a precautionary measure we were rushed to Edmonton, to be under daily monitoring under the event of a premature delivery. We were lucky to have a few more weeks to grow our little warrior big enough for his big day. At 35 weeks it was decided to welcome our second child into the world. Vaughn Wayne Sawchuk was born at 10:11 am, via c-section, at the Royal Alexandra Hospital in Edmonton, Ab. Our handsome boy was 6lbs 7oz and 20” long…the exact same weight but 1” taller than his big brother Rocco’s initial weigh in. Nothing can prepare you for that first initial moment when you see your child for the first time. Oxygen saturation levels were a commonly used term in describing Vaughn’s overall assessment inurtero, and overpowering concerns for Vaughn’s ability to thrive were mixed up in a surreal environment…and then we saw him. So handsome, pink,10 fingers,10 toes and oh so hairy…lol…like a little monkey. He’s perfect…absolutely perfect. What could possibly be wrong? They’ve made a mistake. He’s beaten all of the odds against him already. The world stopped revolving for just that moment….time stood time still. Immediately after, a specialized NICU team whisked Vaughn to a separate room and initialized the necessary procedures to keep him stable. We were granted a few awe inspiring moments to formally introduce ourselves to him, before he was immediately transported to the Stollery Children’s Hospital. I gave my wife a big kiss, and a few brief hugs to Grandparents waiting nervously at the end of the hall and followed my son over to the NICU. It tore Jaime apart, not being able to be by Vaughn’s side, and not know his progression. Waiting for Jaime to be released from Royal Alexandra hospital seemed like an eternity as it wouldn’t be until the next day. 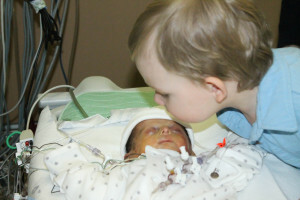 A child needs both parents equally, and after a night of being by Vaughn’s side, the moment finally came when Jaime was able to hold him in The Stollery Hospital NICU unit.The immediate bond that Jaime and Vaughn had is unexplainable. With a full morning together and family close by we decided to get some nourishment. 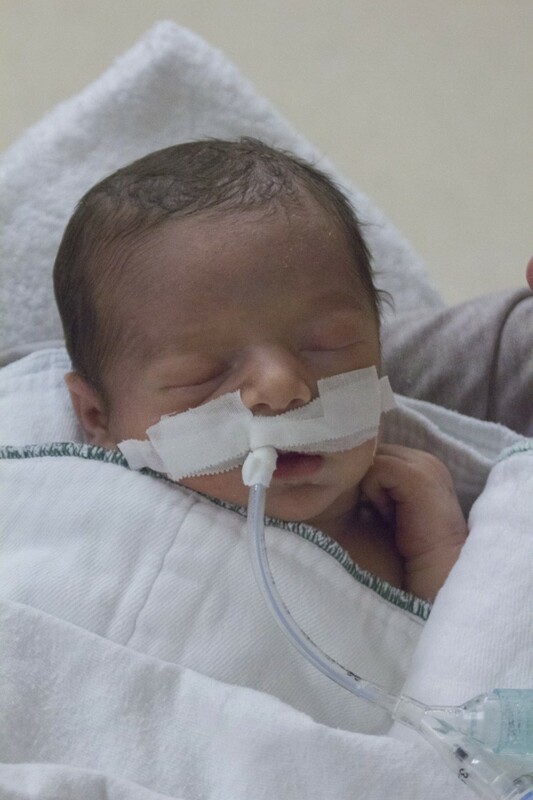 As nurses were putting Vaughn back all snuggled in his incubator is when our eyes bared witness to the most unbearable imaginable moment that still takes my breath away to this day. Vaughn slipped into full cardiac arrest within moments. His situation was escalating extremely fast and soon it seemed to be a tornado of medical staff working on Vaughn. As fast as everyone surrounded Vaughn to revive him,they left just as fast with him to an operating room just across the hall where they were able to stabilize him. He was then cared for in the Pediatric Cardiac Intensive Care Unit. Over the next few weeks, our brave little warrior fought hard at every twist and turn. He underwent 4 surgeries in just 6 days. An incredible feat in itself. Jaime, myself and his 2 year old brother Rocco, by his side for every possible moment. Nothing made either of us feel so powerless as to watch our child go through such invasive emergency procedures. To this day its still so present and vivid in our minds. After having multiple discussions with the specialists, it was decided we list Vaughn for transplant as a heart recipient . Another situation completely overwhelming in an almost already inconceivable state, we had to quickly learn what it means to be the recipient of a heart. Meeting with the transplant team which consisted of various specialists from infectious diseases, Genetics, Neurology and so forth, they began their analysis to make sure Vaughn was indeed a candidate. He was and we were grateful for this possibility. During all of this Vaughn was still fighting through the repercussions of his surgeries. But amidst all of the heartbreaking incidents so far,the day came when our fighter finally opened his eyes. This was an unforgettable,magical moment. He could look at us and follow our voices. We were absolutely overjoyed that this was happening. We never stopped talking to him, singing to him, reading everything to him. Jaime was even able to climb up on his bed every now and then, to get as close as she could to snuggle him. These were the moments that made time stop. Ultimately, Vaughn had developed several complications from his seven surgeries. They say, that there would have been no way that a grown adult could withstand all of the procedures that Vaughn went through in such a short amount of time. Truly he was a little warrior. The most devastating day came upon us when we had to make the heartbreaking decision to let our son go. His body was shutting down around him and was set on a course of motion that would not stop. For almost a month of admiration and doing everything possible, at the end of his 28th day we embraced Vaughn in our arms and with some very precious words and softly spoken promises we watched in awe as our son Vaughn became an angel. I cannot communicate properly with you the spectrum of emotion that arose from that moment, or the days that have followed where we have to move forward without him. It’s not because the words don’t exist, its because we truly hope you never have to fully understand what it is like to lose your child. Through the hardest battle that I’ve ever seen anyone go through, Vaughn was able to find peace and maybe someday so will we.